A prefabricated transportable and fold and refoldable house includes a container type main frame member when on a chassis capable of being pulled by a trailer truck; and dwelling forming members which can be housed in the main frame member, and which can be drawn out of the main frame member at an installation site, and assembled into a house. high speed requiring little or no prior ground site preparation for installment. ultimately with future scientific refinement of not only the house but also peripheral equipment such as solar power units, waterless showers and kitchens, water-filtration, insulation and HVAC devices, this house can be installed anywhere in the world and at minimal cost to the houseowner or government housing programmers as environmental and ground location issues are resolved by sustainability and mobility features of the house. I am looking to outright sell my patent to an industrial company with the will and financial ability to produce my house and sell it worldwide. In the past I have approached one or two industries "heavies" to take my idea and build my house without result. I have not marketed my idea to housing manufacturers who may not welcome a "game changer". When and if my patent is executed correctly the breadth of the market will be immense compared to the required investment, and contribution to world peace and prosperity incalculable. Finally, I am a co-assignee for a Japanese patent in the invention of a foundation system referred to earlier as "ocean container and twist-lock ideas" for my house. 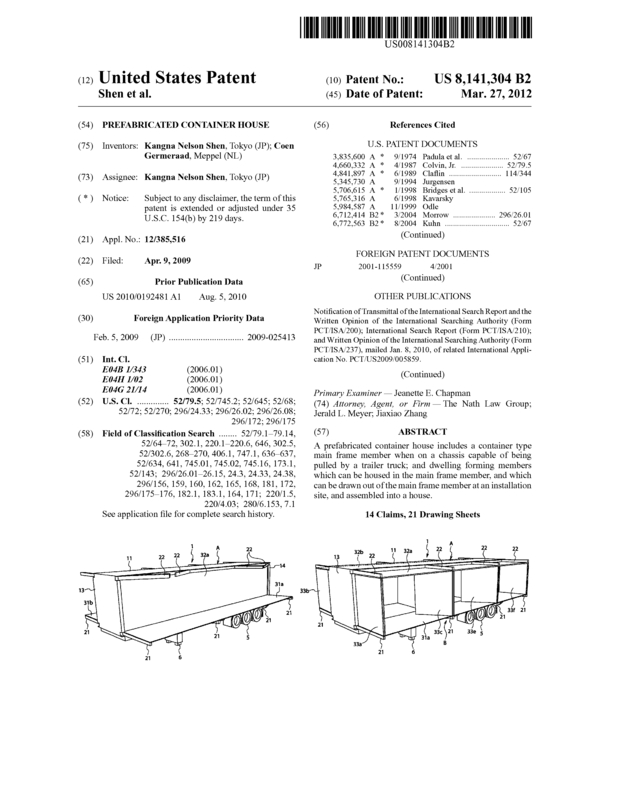 Page created at 2019-04-25 4:02:45, Patent Auction Time.